The Life Extension Blog: Machine Learning and Medicine: Is AI the Future of Psychiatry? Machine Learning and Medicine: Is AI the Future of Psychiatry? What Is the Future of Medicine? 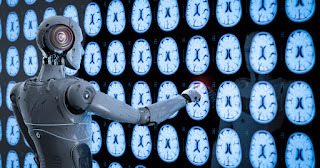 Extension’s Michael A. Smith, MD, Kristen Willeumier, PhD, provides some insight into AI technology and its relationship with psychiatry which, along with neurology, studies and treats diseases of the brain. Dr. Smith predicts that AI will soon be an important part of how we understand and treat disease. According to Dr. Willeumier, some of that technology is now “ready for prime time.” Download this Live Foreverish podcast episode for FREE on iTunes! How can artificial intelligence be used in psychiatry? Dr. Willeumier provided the example of traumatic brain injury and posttraumatic stress disorder, which can have overlapping symptoms yet very different treatments.3 Artificial intelligence may become a useful tool to provide diagnoses in cases such as these. What psychiatric conditions can AI be used for? In people with depression, specific neurobiologic patterns in the brain are associated with different types of the disease. Different patterns necessitate different targeted treatments to get the best outcome. Machine learning can rapidly diagnosis the type of depression a patient may have and determine the treatments that are most effective for an individual. Neuroimaging data or clinical variables from patient reports provide data that can be analyzed by a machine that learns what patterns in the brain correlate with specific clinical symptoms and which medications are the best targeted treatments, which can eliminate the need for depressed patients to go through the process of trial and error to find out which treatment is best for them. Alzheimer’s disease is another brain disorder that has benefited from AI. This progressive, devastating illness still can’t be diagnosed with certainty in living people and can only be verified during examination of the brain at autopsy. However, researchers are using brain imaging data to train machines to detect whether a living individual has Alzheimer’s disease and how it could progress.4 Data concerning sleep and movement patterns that are used to predict the risk of falls are now being analyzed for changes in movement that can predict Alzheimer’s disease, which needs to be detected early if available therapies that can slow its progression are to have the best chance of being effective. “AI is being used in multiple platforms across multiple diseases, and I think there’s a lot to be excited about,” she enthused. Dr. Smith and Dr. Willeumier agreed that technology is all about improved outcomes. “I think we can harness the power of technology to help us live healthier lives,” Dr. Willeumier concluded. About Live Foreverish: Join Dr. Mike as he sits down with some of today’s leading medical, health, and wellness experts to discuss a variety of health-related topics. From whole-body health to anti-aging and disease prevention, you’ll get the latest information and helpful advice to help you live your life to the fullest. See the full list of Live Foreverish Podcast episodes, available on demand. Amen DG et al. J Psychoactive Drugs. 2012 Apr-Jun;44(2):96-106. Raji CA et al. Brain Imaging Behav. 2015 Sep;9(3):527-34. Mirzaei G et al. Rev Neurosci. 2016 Dec 1;27(8):857-870. Amen DG et al. J Syst Integr Neurosci. 2017 Apr 10;3(3):1-9.